What tools would an alchemist use in the quest to transmute other elements into gold? Alchemist Heating a Pot, by David Teniers the Younger (1610 - 1690), oil on canvas. David Teniers the Younger, a seventeenth-century Flemish painter, had a serious thing for alchemy. Over the course of his career, Teniers painted some 350 different scenes, illustrating just about every aspect of alchemy imaginable. All of Teniers’ alchemical scenes, however, show the alchemist’s workshop as a place of experimentation and inquiry–a space full of instruments integral to the experiments, tools that were built and maintained through a plethora of different technologies. In Teniers’ best-known painting, Alchemist Heating a Pot, an elderly alchemist anxiously leans forward, carefully handling a small bellows, fanning oxygen into a small fire under a ceramic vessel. The old man is surrounded by a variety of instruments–glass jars and flasks are artfully arranged on his shelves, ceramic containers are strewn throughout his workshop, a pair of tongs leans up against the desk, and a clay crucible sits on on a small stool. More than anything else, Alchemist Heating a Pot conveys the sense that alchemy–itself part chemistry, part speculative philosophy–is a science that is unequivocally and completely dependent on its instruments. There are at least five different tools at work in just that small segment of Teniers’ painting. Alchemy is one of the most curious subjects in the history of science–it evokes both method and magic in popular imagination. Alchemy is one of the most curious subjects in the history of science–it evokes both method and magic in popular imagination. Teniers brilliantly juxtaposes light and shadow in his paintings, leaving the viewer unsure just how illuminating alchemy really is. At its very core, alchemy focused on the notion of transmutation–the ability of one element to morph into another, especially the ability to turn elements into gold. (If Rumpelstiltskin had only been so lucky!) In order to understand elements on their most basic level—in order to extrapolate how to transmute one into another—alchemy focused its experimental efforts on the processes of distillation, sublimation, and crystallization and how they affected different materials. Exploring these processes, however, required sophisticated tools and technologies as well as scientific means and methods. And just what kinds of tools filled alchemy’s workspace? As depicted in Teniers’ workshops, we see alchemy’s experimental space function as a precursor to the modern scientific lab. 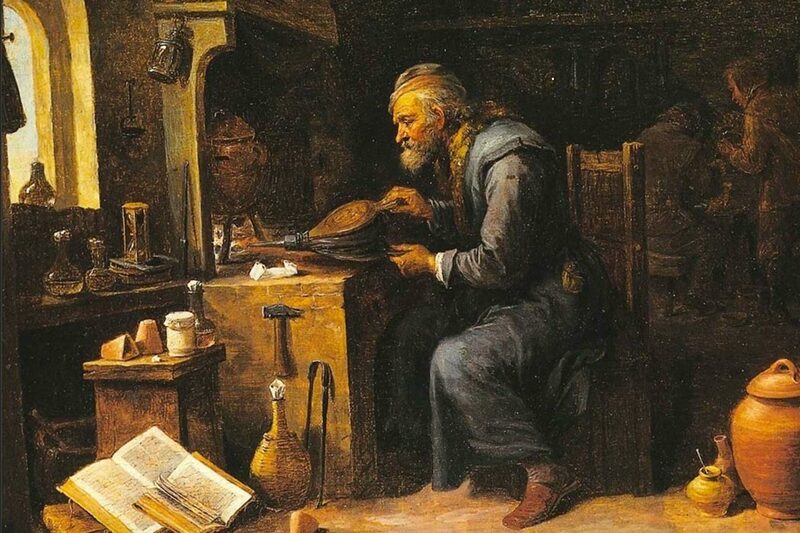 Where we might expect to find beakers, microscopes, and computers in contemporary labs, we instead find instruments like crucibles, flasks, and alembics in alchemical workshops. Understanding the process of distillation–the purification of a substance or the creation of a concentrate from a liquid mixture–occupied considerable experimental interest and required specific tools. To that end, alchemists relied on three primary components: cucurbits, alembics, and lutes–tools that were then assembled into complex apparatuses, which were heated to separate substances into their purest forms. Cucurbits were round containers made to hold the substance being distilled from one thing into another. Cucurbits were generally made of glass, copper, or earthenware ceramic. (Their name comes from the Latin cucurbita or “gourd,” in reference to their shape.) The alembic was a rounded glass head with a beak that fitted on top of the cucurbit–perhaps the most iconic of alchemy’s laboratory tools. Alembics varied considerably depending on the amount of condensation or sublimation the alchemist wanted to coax out of the original mixture. Consequently, the glass heads could be rounded, cylindrical, beaked, or bulbous. The joint between the two was sealed using lute, a sticky mixture that often contained dung, egg whites, and clay. After alchemical apparatuses were assembled, liquid was added to the cucurbit and the gourd-like vessel was nestled in a bed of sand or ashes and heated to begin the distillation process. As the liquid boiled and evaporated, it condensed in the alembic, and the distillate was then directed out of the alembic’s beak and into a container of some sort. The hope was that the distilling process would transmute one substance into another. For distilling dry materials, alchemists also used a tool called a retort, which had a shorter height than the traditional alembics. Ultimately, fire was the most significant tool in the alchemist’s workshop–fires were carefully curated and meticulously maintained, thanks to the construction of furnaces and the use of different fuels like wood, coal, charcoal, etc. All of these alchemical components are painted in the workshop featured in Alchemist Heating a Pot. Indeed, finding all of these alchemical tools is almost like a Where’s Waldo? in David Teniers’ paintings. Alchemy’s emphasis on questions of transmutability meant that the science was heavily invested in the design, construction, manufacture, and maintenance of tools suitable to its methods. In early modern Europe, alchemical tools were integral to setting up successful experimental practices, particularly through the use of specific glass technologies, ceramic manufacture, and a sophisticated manipulation of fire through fuel and furnaces. Alchemist Heating a Pot is the quintessential depiction of these tools and technologies. Commencement speeches have inspired, motivated and captivated many. 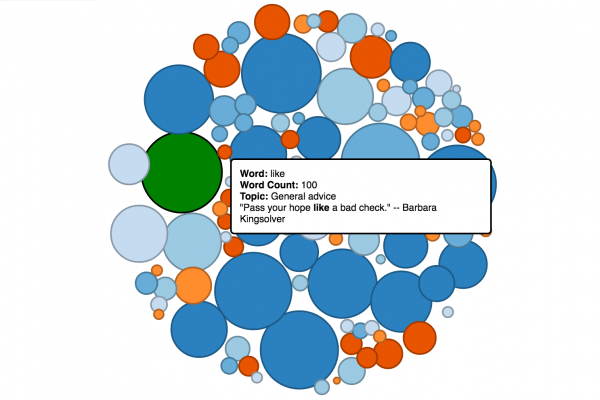 Just what makes the words found in them so wonderful and life-affirming?